Some of my readers may recall that I started a scarf some months ago. I then became sidetracked knitting up a baby’s gift for an expecting colleague. But in the spirit of WIP Wednesday, I thought I would share with you my progress – yes I have still been working on the scarf. I did warn you I was slow and did not have much spare time for my true pleasures. Basically the scarf is half way complete. After I worked through adjusting the pattern to suit my desired width I basically need to repeat 6 rows until I am happy with the length. I like quite long scarfs. I am roughly at 75cm and only 75cm to go. To my horror the other night I somehow picked up a stitch. I had been knitting in the dark whilst watching a movie with The Hubby – so you really cannot feel too sorry for me. But a mistake of this kind is absolutely detrimental to this pattern because it is very specific about the number of stitches being worked due to the diagonal knit. Heartbreakingly I pulled out 6 rows and I was scared. With this stitch it is not so easy to simply work backwards. On the pearl side you are knitting 3 together and making new stitches all the time. So it was really hard to fix the mistake without pulling the scarf off the needles and pulling thread. This is what I had to do and I miraculously put the stitches back on the needle and managed to salvage the diagonal pattern. Phew. I was so, so relieved. With that drama aside, I am loving the pattern the diagonal knot stitch gives and finding it a fun stitch to knit. The original pattern for the scarf can be found here and a great video tutorial on the knot stitch can be found here. All are fantastic resources from Cotton and Cloud. So here is my modification to the pattern. Remember if you want to make this yourself and alter the width make sure you cast on your stitches in multiples of 3, ending on an odd number. I highly recommend checking out the original pattern and video as a guide to the scarf. Hopefully I will be done by Winter. Yes, that is 3 months away for me in Melbourne but I m trying to be realistic… What are you knitting, quilting, sewing and crafting? P.s. and in the spirit of Yarn Along I am currently reading Amy Tan’s 1000 Secret Senses. Loving it so far. 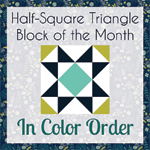 WIP Wednesday is a fantastic idea! I always have WIP’s going. Right now I have a rug I am braiding and a cardigan I have been knitting for quite sometime. It had to be set aside due to holiday knitting, but now I am distraction free and hoping to set a time line to finish it! I have never heard of or tried the knot stitch but it looks wonderful! I can’t wait to try it out! Oh wow, that looks gorgeous. I wish I had the skills to do that. I’m a knit one purl one knitter, but you’ve inspired me to get the needles out. Blogging inspired me to knit as well. This is actually really easy (trust me, I am not a very fancy knitter). You do not need to increase or decrease at all. The only tricky thing is the knot stitch but after practising it a few times you will get it. I started slow but am quite quick with it now. Would love to see what you come up with! Thanks for your support, I’ll give it a go then. (Or perhaps I should sew the binding on my quilt that’s been sitting there – so close to finished yet so far – for the last 6 months) Oh dear… That’s it! I’m doing it tonight!! Then I’ll knit something! Yay. Thanks. I like it. Looking forward to wearing it. Can’t wait to see the finished photos, clever girl! 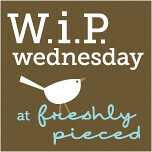 I’m inspired…think I’ll start WIP Wednesday over at ‘Pearls’. I don’t know if I will do it every Wednesday (because I may not make enought progress) but I will try. It is fun to post about how you are going rather than waiting until something is completely finished. Lovely! 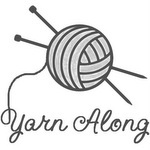 What yarn are you using? It almost looks like Spa- wonderful stitch definition! Scarves always take me forever so I know the feeling- but it will look just amazing when you are done! I was so eager to get started on this I just raced to Lincraft (Australian craft superstore) and bought the softest colour I could find. It was actually quite cheap but just so soft and I loved the colour. Perhaps not the best quaity yarn but served its purpose well. Yay. I love following your daily stitches so thrilled that I have inspired you with this one. Thanks for the credit and I highly recommend you check out Cotton and Clouds tutorials. WIP Wednesday is fun, may not have enough progress for every week though. Happy Knitting. Indulge when you are in the comfort of your own home. Her you tubue episodes are fantastic too! Yes so many fun hobbies and just not enought time! I tend to take ages to finish something as well, which doesn’t help the problem. Can’t wait until it is finished. Scarves do take quite a long time, don’t they. I think this is just beautiful though. What an intricate stitch. I can’t wait to try this stitch!